The word “hero” has been prostituted and cheapened in recent times. The ability to dunk a basketball does not a hero make. We venerate celebrity, electing the most vain among us as our idols. But what of those whose contributions occur on a much smaller stage? What of those who would aim no higher than to raise a godly family? What of the man who is fiercely devoted to his wife and his children? What of the one who quietly labors to provide for those he loves? How are his deeds to be measured? Is he somehow less heroic than our million dollar athletes and our rock star gods? It should come as no surprise that my father ranks as the primary male influence in my life. I’ve had many influences and I’m thankful for each, but I only use the word “hero” in reference to my father & Jesus. All my life, I’ve wanted to be like my Dad. I used to study him: the way he sat in church, the way he read the Sunday paper, the way he ate his eggs. I copied his sounds: the way he laughed, the way he snored, the way he spit out his toothpaste. He was a mountain of a man to me, a larger than life being. He was the funniest person I knew and I loved it when we would joke around and play and have tickle fights. But he was the voice of discipline to me, too, and I feared him for this. I dare not disappoint him for fear of his belt. I learned of God’s character through my relationship with my Dad. Even today, I approach God with a similar sense of laughter and fear. My father was a complicated, layered individual. He was a skeptic, paranoid to the core. He taught me to always question, to always be on guard, to look out for myself. “If anyone is ever picking on you, stand up for yourself. If you don’t stand up for yourself, nobody else is going to do it for you.” Blake King called me stupid on the playground in kindergarten. I bloodied his nose and I did so with righteous indignation. At the behest of my mother, we had a talk and Daddy redefined what it meant for me to stand up for myself. But inwardly, I suspect he was pleased that his boy took his words to heart. My Dad always answered when I called. We used to play hide-and-seek and I would sometimes get scared if I couldn’t find him quickly. I would only need to call his name and he would come out from his hiding place to relieve my fears. When my father became ill in 1987, I would visit with him each morning before school. After months of treatment, his body began to break down, his resistance slowly eroding as the cancer spread. One morning in particular, I went in to see him before school. He looked to be asleep in his hospital-style bed that was in our living room. I called out his name, but for the first time, he didn’t respond. I reached for his hand and called him again, but again no response. I don’t know what you think about God speaking to us individually. I’ve never heard voices, I’ve never seen an angel. But in that moment, standing beside my father as a 10 year old, God spoke to me. I say this because a thought was placed on my mind and in my heart in that moment that was far too profound to be my own. I remember thinking, “My father may still be alive, but he’s not really living.” In that moment, I understood the extent of his illness for the first time. I saw how weak and frail he was. My father was a big man, 6’2″, 225 in his heyday. But as the cancer spread to his kidneys, he literally withered away to less than 150 lbs. His face was pale, his strength was gone. 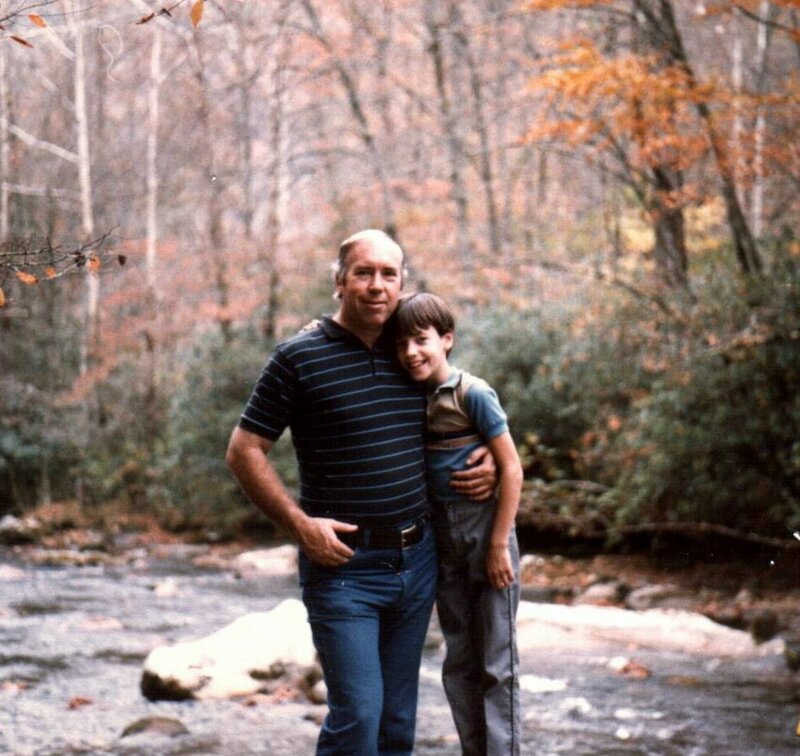 My dad was a giant, full of vigor and jokes and life. But the man I saw before me bore little resemblance to my father. In that moment, I prayed that if the only reason my father was still alive was so I would have a Daddy, then I didn’t want that. I wanted my Dad to be better. So I prayed, “God, it’s OK with me if you take my Daddy as long as You promise to be my Father.” My dad died about a half hour later. I miss my Dad now more than I did 19 years ago when he died. Now that I’m a father, I desperately crave his presence. The silence of his absence is most deafening on those special days in my life: graduations, my wedding, the birth of my children. I long for him to meet my wife, to meet my children. But I live in the hopeful expectation that someday, I’ll see him again. Oh how sweet our embrace will be on that far distant shore when I call your name and you come running to meet me with open arms! And we in turn will call out the name of our one Father, the God who created us and saw fit to make us father and son and brothers in Christ! Until that day comes, my life stands as a testimony to you, Dad. I will see you soon. This entry was posted in Another Man, Dad, Family. Bookmark the permalink. Thanks for reposting this. I am sorry you didn't have him longer. I know you miss him always.